LOS ANGELES – Kobe Bryant watched the end of the Los Angeles Lakers' final preseason practice through a training room window while running on an anti-gravity treadmill. When reporters turned to look at him, Bryant quickly closed the blinds and kept running. For the first time since 2006, the Lakers will open the season without Bryant on the floor when they face the Los Angeles Clippers Tuesday night. And no one can say for sure when Bryant, who is recovering from Achilles surgery, will rejoin his teammates. "Listen, we are not trying to hide or pull a curtain back," Lakers coach Mike D'Antoni said "The Wizard of Oz is not behind the curtain. He will go when he can go." Bryant suffered the Achilles injury against the Golden State Warriors on April 12 and hasn't released an updated timetable for his return. After Bryant had surgery, it was estimated he would be out until at least mid-October and possibly as late as mid-January. 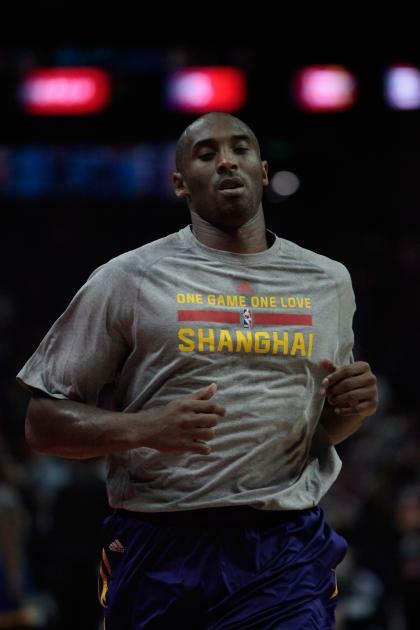 Bryant told reporters last Thursday that he has scaled back his rehabilitation. "He just scaled back for just one week," D'Antoni said. "He pushed it pretty good and now he is settling in and he will be up again. There will be starts and ends and starts and starts. He'll just have to monitor it. He knows better than anybody, so he'll know what to do." D'Antoni said there still isn't a date for Bryant to return to practice or embark in on-court drills. He also said that Bryant could need several weeks of practice and drill work to get back to an elite form before he returns to play in games. "He has to be able to run, sweat, get his timing back," D'Antoni said. "There's a lot to it. He doesn't want to go out and be, 'Oh, I made it.' He wants to be the best. After six months you have to have at least some activity on the court." Steve Blake, who averaged 10 points as a starter last season, will replace Bryant at shooting guard. D'Antoni said there is a lot more than scoring that the Lakers will miss during Bryant's absence. "It's [Bryant's] presence, it's the going to [someone] else at the end of the game," D'Antoni said. "That is what we're going to miss."